Fantastic alteration of a simple jar! 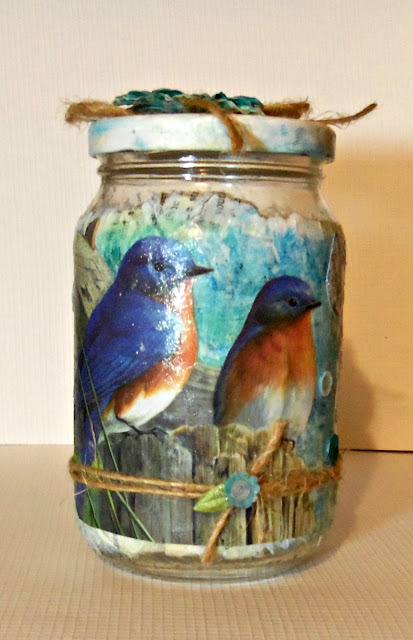 Your beautiful birds and your embellishments made this jar unique and fabulous! Thank you for joining the April Challenge of the Country View Challenges! Wow! 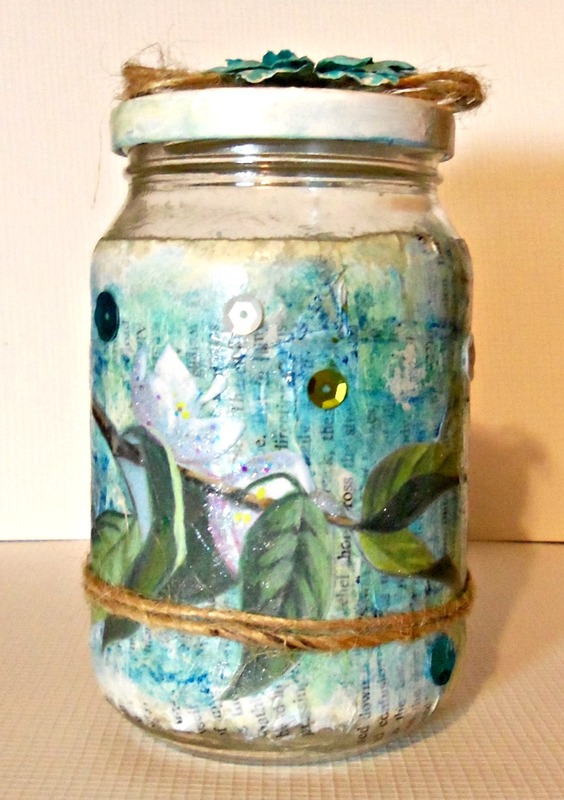 Your friend is going to be doubly blessed--once with this beautiful altered jar and another by the treats inside! (I love Almond Joy, and now I'm going to be singing that marketing ditty in my head the rest of the day!) What beautiful birds and a great story to go with it! Love bluebirds and so funny to read about the juveniles! Great use of some ordinary items for an amazing transformation! It was interesting to read about the Bluebirds and their antics with the Grasshoppers. We don't have these pretty birds in the UK. Your recycled jar looks lovely. Never tried that trick with the gelatos. Hugs Mrs A.
Wow! I Love your bird jar! Very adorable! It is absolutely amazing, Janis. So very creative and love the sparkle! So happy you shared in my Critter and Creature Linky Party, and your creations is definitely eligible to enter, doesn't have to be stamped. Thank you for joining in! Your jar looks beautiful Janis. I love to recycle too. The bluebirds look beautiful and I enjoyed reading how you made your gift. 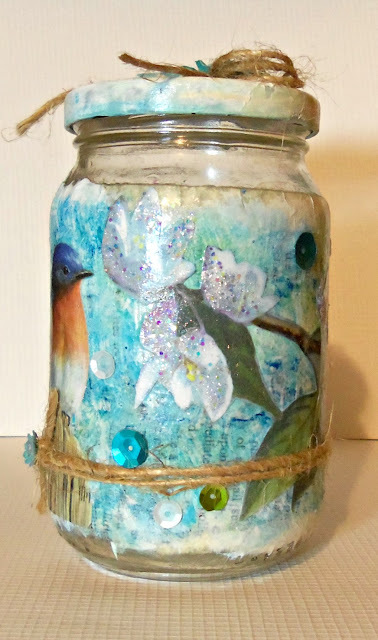 Such a beautiful spring jar, those birds are so pretty.Thanks for joining in with our spring challenge over at Country View. so pretty! I am not having that much success with my gelatos! great job! This is a great idea! I love how the jar turned out! I love bluebirds too! Loving your decorated jar ! Oh my gosh Janis, this is so beautiful! I need to bookmark it so I can read your step-by-step again and give it a try myself. I am especially interested in the way you used the Gelatos because I still haven't braved my set and I need ideas to get me started. Haha...you beat me to those dewdrops as I still haven't used them either. They make perfect flower centers! This project is even more fun with the recycled glass jar and makes a wonderful keepsake. Such a wonderful idea. That jar will always be a joy to look at. Fabby jar ! Thank you so much for joining us again over at Country View Challenges ! 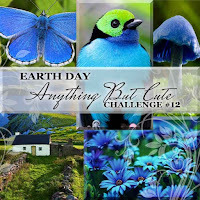 Thank you for joining our Earth Day challenge at Anything But Cute! Your jar is terrific. Love how you gave that jar new life. Now it will be a treasured keepsake. Thanks for sharing. This jar is a double delight because it is filled with yummy goodies and also uses recycled bits-how fantabulous is that! Totally fantabulous! Your birds are so awesome sauce and beautiful. The added glitz ties everything together so well and creates a lovely 3D image. Wonderful lid as well! LOVE the makeover you gave this jar! The bird images are so gorgeous and the colors are happy and full of energy. This has a definite positive vibe and is such a great tribute to nature. Love the layering you incorporated and how the whole thing looks like it belongs in some high-end botanical boutique! Really stunning! I'm so glad you shared your talents with us for this week's Simon Says Stamp Monday Challenge! What a fabulous idea, Janis. This is fabulous. Thanks for sharing it in our Things With Wings challenge. I really hope that you will join us for our new challenge starting this week. We really enjoy having you play along. I just love this project! I love that you took our challenge "off the page" and created something so joyous and colorful and fun! Thanks for the tips on how you made this...it's wonderful! Thanks for sharing with us at the Really Reasonable Ribbon "Things With Wings" Challenge! Wow, this is so pretty!! I love your altered jar and the birds and background are absolutely wonderful. Thank you so much for sharing with us at the Simon Says Stamp Monday Challenge Blog!! 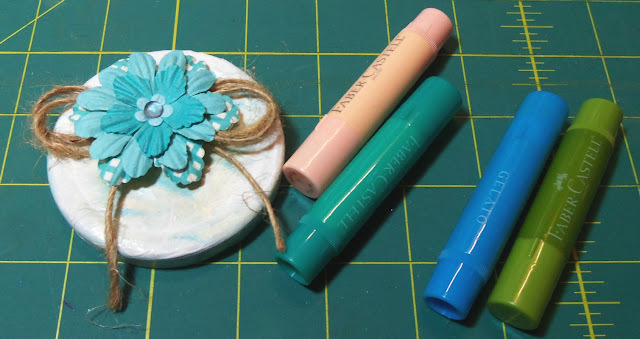 Super cute--congrats on the SSS Monday challenge blog spotlight! Wow ! These are so wonderful ! Thank you so much for joining us at Craftin' Desert Divas In The Garden Linky Party .